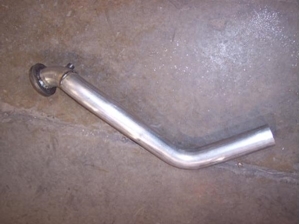 We are proud to offer this 2-1/2" mandrel bent turbo downpipe for your 1980 International Scout II, Terra, or Traveler. It is designed to be MUCH more free flowing than the stock cast turbo outlet elbow, to give you both better performance and lower your exhaust gas temperature. Did you know that the stock piece makes two sharp bends, and necks down from 2-1/2" at the turbo to under 2" where the pipe bolts on? Install our downpipe, and let your local exhaust shop finish the 2-1/2" system back to the tailpipe and you'll be VERY impressed with the performance gain you will achieve. This downpipe is welded in house on a specifically designed jig to ensure proper fit on your Scout. It has a 1/2" thick flange where it mounts to your turbo to prevent warping and leaks, and heavy 16 gauge mandrel bent tubing to ensure long life. We include a welded-in 1/4" NPT bung for your pyrometer (EGT) probe as well. It was designed on my personal 1980 SD33T, T-19 equipped Scout II to ensure adequate clearance around the starter, frame rail, clutch linkage, and all other parts. To install this downpipe, you will need to remove the old exhaust elbow from the turbo outlet, removing the four long studs from the outlet. This generally proves to be the most difficult step of the process. You will need four bolts or shorter studs (not included) in order to replace these when you install our downpipe. Simply reuse the gasket that was originally in place, and installation is complete. The downpipe closely follows the routing of the stock exhaust, as shown in the above photo. Now you need to take your Scout to a local exhaust shop to have the new downpipe either attached to your current existing exhaust, or have them replace the entire system with a 2-1/2" pipe all the way back (For the best performance gain). Sorry, CermaKrome is no longer available.